Truly, I had the idea that studying Western Philosophy would help me find proverbial “meaning” in my life; that all I needed was to study the “great minds” before me, and somehow, magically, this great Canon of intellectual endeavors would relegate me to the class of those who “know”. And yet, as my academic research efforts were culminating in this paper; as I typed away in a pedantic and essentially perfunctory way, I was forced to interact with one of the most empty and lonely times of my life. “But I should be happy, I am writing about philosophy”, I kept affirming myself. I wasn’t happy. I was even more lost and undirected as I had ever been in my mostly lost and undirected existence. What happened in the next few moments has proven to be the most critical experience in my spiritual life. My soul who had been searching, essentially from childhood, for answers to the Big questions was about to be called in a direction towards which there was no map. But a direction which saved me in innumerable ways nonetheless. 2003 proved to be the last vestiges of these promotional strategies called “CD Clubs”. Each month, a CD would be sent to you. If you did not want it, you could send it back, but if it was not received within 10 days, you had to buy it. This is how a crooner like k.d. lang ever even got into my house, a house filled with Grunge and Death Metal. A house whose musical tastes were about as mature as that boy you danced with at the fall dance in middle school. In fact, that k.d. lang was ever even sent to me was wrong. For surely I never checked off “adult alternative”, or whatever “genre” k.d. fits into. 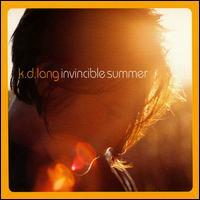 I never sent “Invincible Summer” back and that CD had remained unopened on the kitchen table for months. On this hot July day, this soon to become for me Invincible Summer, I pulled off the shrink wrap, cringed and tossed the CD in the CD player. I must have been particularly forceful because the player sputtered and wheezed, tapped and zipped and ultimately began to play. But not from the beginning; from track 5 “Extraordinary Thing“. “Verily I say unto you” that what I heard was beyond anything my inner soul had ever encountered. But when I say this, I am not talking about k.d.’s stellar voice. Yes, she is exceptionally talented. We all agree on this. Of course, her voice is impressive and cannot be ignored. Yet what essentially took my soul from a flattened two dimensional countenance to a living thing of multi-dimensions was the soul that supported this phenomenal voice. Clearly, this song is a love song. It is not a song that one would slate as an expose of the Human existential experience. But this is how I heard it. I heard and met what I take to be a soul with whom I had something in common. One who understood the angst and elation of living a human life. One who had walked the line of searching desperately for meaning, love, understanding, validation, and existential acceptance. One who had questioned her own worth, her own definition, direction, pain and ecstasy. And while Kurt Cobain was great on angst, elation and authentic searching was something he never seemed to understand. There is much more about this event that I cannot disclose here. But I have given enough for newcomers to this blog to understand why I call it “Extraordinary Thing”. And so, k.d. if you or your entourage should read this, know that there is at least one soul out here whose life has not just been touched by a great voice, but a soul who has been thoroughly transformed and embodied in ways even I do not yet totally understand. It is with the greatest caution that I tell you this as I am pretty sure you are not so keen on being showered with effusive praise in this way, or seen as a mentor or teacher. But the truth is, k.d., that for me you are all of those things. And while I likely will never get to meet you or show you in person how I really am, I know that just by writing this, the energy is there for you to come upon when you feel ready.